EY recently joined with Keep Bermuda Beautiful [KBB] for a cleanup of Bermuda’s shorelines, with 484 volunteers removing some 9,000 pounds of litter and debris. Among the many items removed were carpets, a medical IV bag, a bed pillow, a dozen octopus pot traps, motorbikes, and over 1,500 glass beverage bottles. 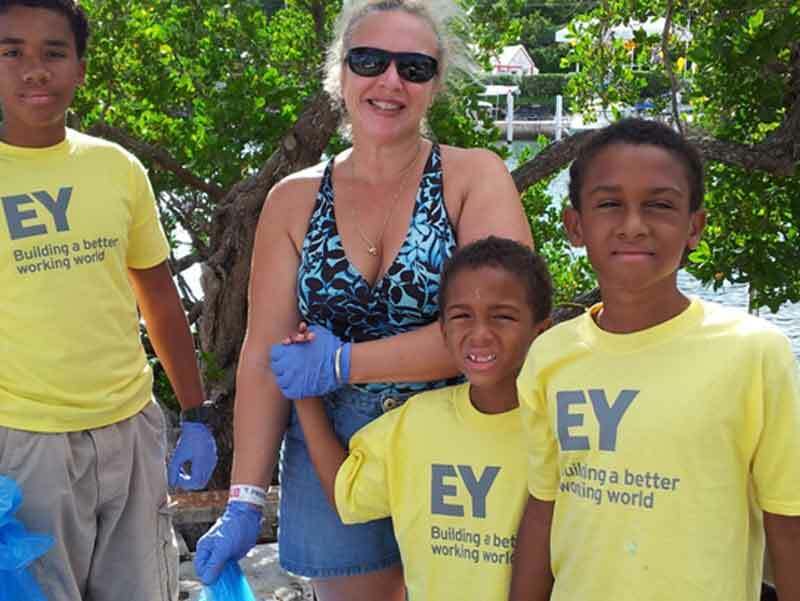 “We are delighted to have EY play such an active role in supporting as title sponsor this year’s event and helping Bermuda complete the world’s largest coastal cleanup,” said KBB Executive Director Anne Hyde. 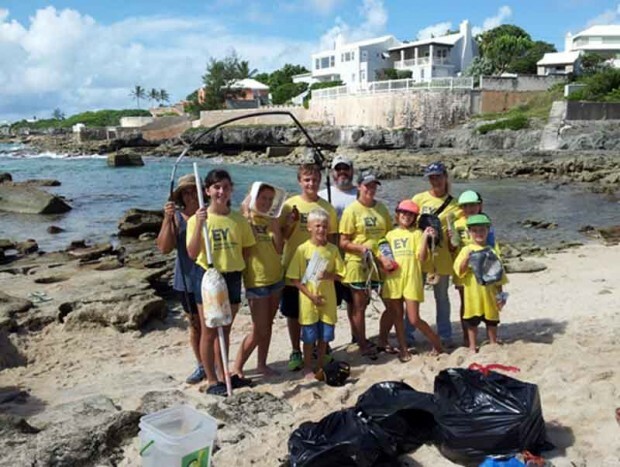 The September 20 date was chosen by Washington, DC-based Ocean Conservancy as part of an International Coastal Cleanup involving more than 90 countries. All participants were asked to become ‘citizen scientists’ for the day and gather important data by tallying each piece of litter, while bagging up the debris. 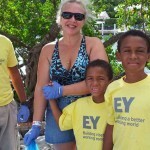 The EY Bermuda Coastal Cleanup was kicked off at EY’s offices on Bermudiana Road by a visit from The Litter Critter, KBB’s mascot, and followed by a promotional wave with Johnny Barnes. 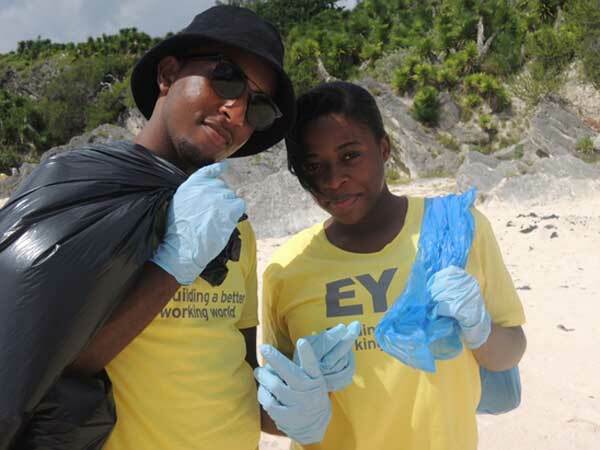 EY came on board as title sponsor of the event and participated with employee teams at Tobacco and Church Bays. 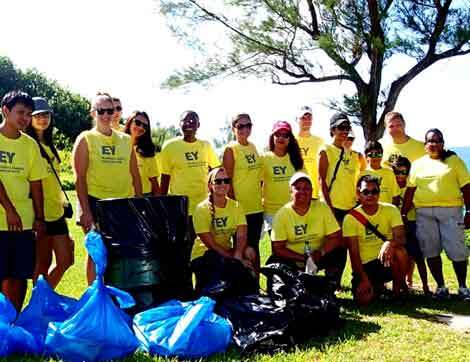 “We are proud to sponsor the coastal cleanup, and delighted that we were able to play an important role in an initiative that positively impacts the quality of life and environmental health of Bermuda,” said Jessel Mendes, Partner, EY. 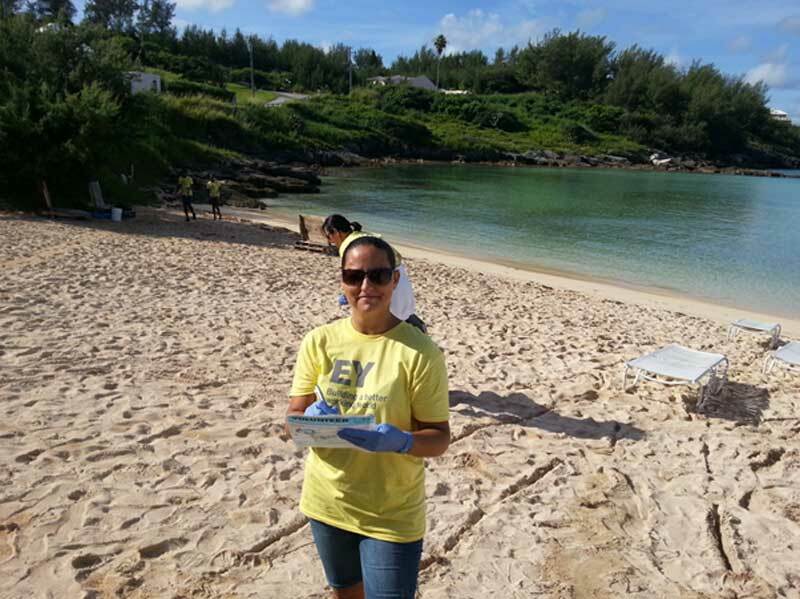 “KBB is supporting vital research that will hopefully lead to a better understanding of how marine debris is impacting the island. KBB said, “A wide variety of groups registered for the event including corporate organizations, sports and civic groups, students, families and neighbours. “Corporate teams were from EY, Hiscox, Validus Re, Butterfield & Vallis and ACE. School teams were from Saltus Grammar School, Somerset, Heron Bay and West Pembroke Primary Schools, Sandys Sec and Clearwater Middle Schools, Cedarbridge and the Bermuda College. 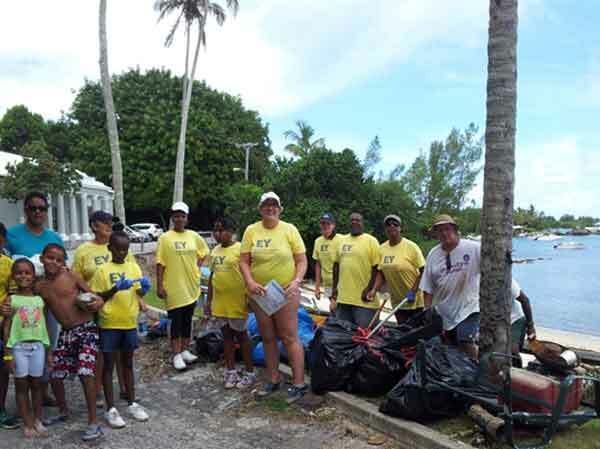 “Area residents from various neighbourhoods took an active part in cleaning up shorelines in their neighbourhoods including Ely’s Harbour, Pilchard’s, Benny’s and Doe’s Bays and the St. David’s Public Dock. “The Police Eastern CAT Team helped at St. David’s Dock while the Central CAT Team lent a hand at Ducking Stool along with members from The Bermuda Coalition. 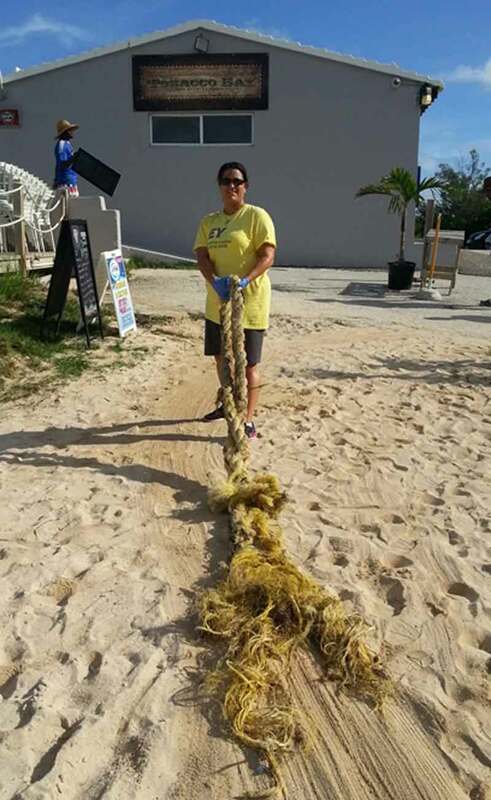 Additional participation came from the Sandys Parish Council, the Bermuda Offshore Cruising Association, Flames of Unity youth group and numerous families. 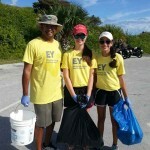 Hundreds of students who are required by their schools to do community service participated. 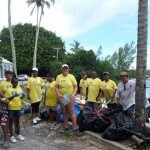 “A special thank you goes out to the Minister of Environment, Jeanne Atherden, who joined the Cedarbridge group Teen Girls in Focus as they scoured the shoreline at Spanish Point Park [also known as Pontoons] for litter. The Minister said she enjoyed working with the students. “KBB is grateful for the continuing support from the Department of Parks and W&E Waste Management waste collection teams. 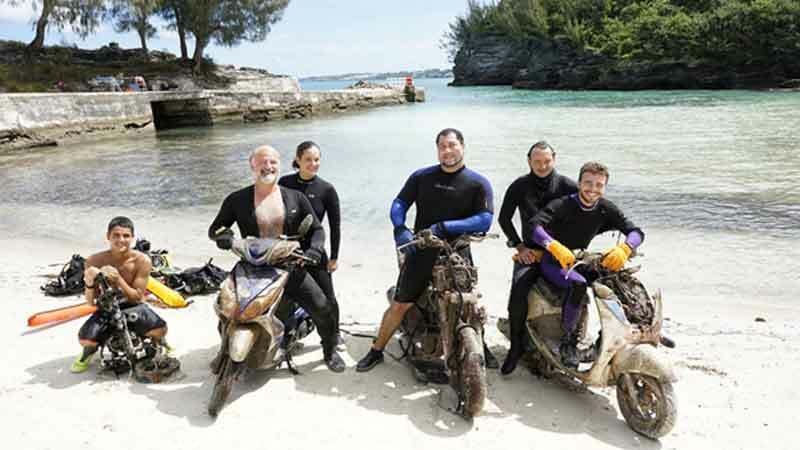 “Divers from Bermuda Sub Aqua Club, Bermuda Ocean Explorers, Bermuda Institute of Ocean Sciences and Blue Water Divers retrieved countless beer bottles and multiple motorbikes from the ocean floor at Clarence Cove and Mangrove Bay. 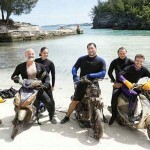 The many ways of participation included diving, snorkeling, kayaking and beachcombing. “Some unusual items found this year included carpets, bunches of bananas and a bed pillow which are all local items. Other weird finds this year which had floated from hundreds of miles away were a radiosonde weather instrument, a medical IV bag and a dozen octopus pot traps. “Bermuda is situated near the center of the North Atlantic gyre which is a series of currents that circle up the coast of Florida, cross over top of Bermuda and then circle down past the coast of Africa. The strongest current in this gyre is the Gulf Stream which comes up from the Gulf of Mexico and brings debris from other countries with it. 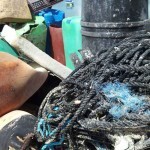 “Ocean trash is a growing problem around the world. 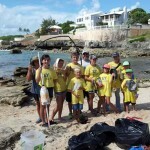 Tons of marine debris, particularly plastics, gets washed up on Bermuda’s shore during the course of the year. It is especially apparent after a storm surge. 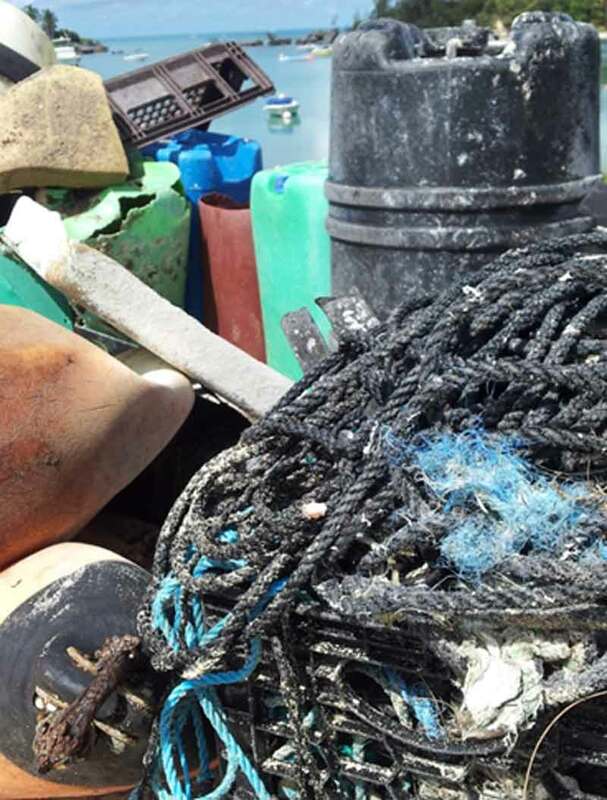 While most of the debris floats from hundreds of miles away, some of it is Bermuda’s trash. 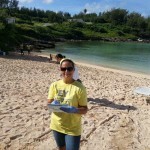 “Bad boating habits or being careless with a beach picnic can contribute to what gets into the ocean. Wind and rain can also wash litter from the land into the ocean. Trash travels from roadside to storm drain to the ocean. 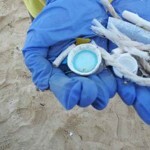 “Once at sea, the trash poses a threat to marine life by entanglement or ingestion. Sea turtles die from ingesting plastic bags and balloons, or by getting tangled in discarded tangles of rope. 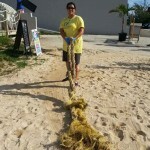 Birds, fish and turtles are being negatively affected by man-made debris. 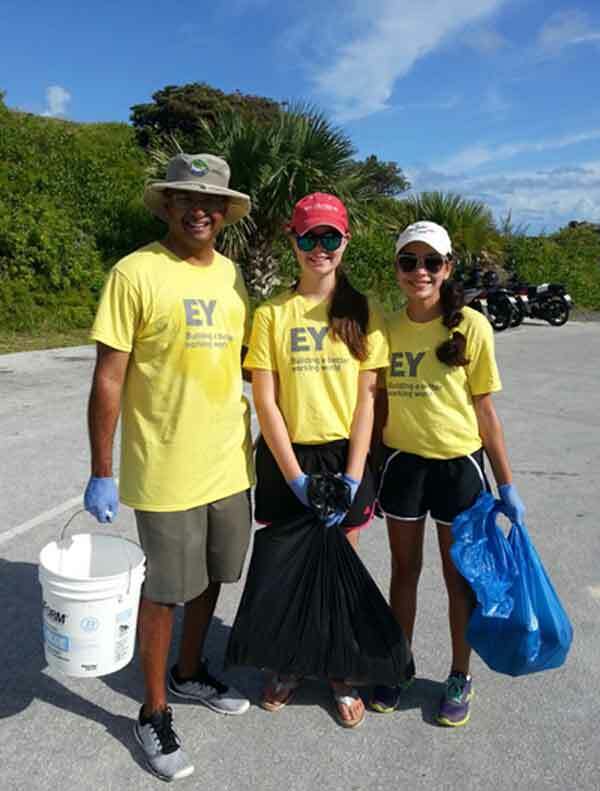 “During the EY Bermuda Coastal Cleanup, KBB volunteers found 9,000 pounds of trash along the shoreline or in coastal waters. Participants were asked to tally each item of litter they found. There are forty-one categories of litter items listed on the data collection cards. 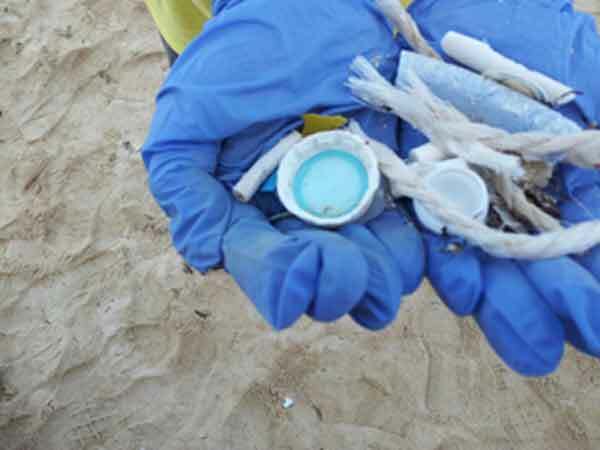 “Amongst the tons of litter and debris collected, the list of items included 3,849 small fragments of plastic [micro-plastics], 1,522 glass beverage bottles, 612 plastic bottle caps, 249 yards of rope and 196 plastic straws and stirrers. “The data is sent to Ocean Conservancy who is headquartered in Washington, D. C. and will be compiled for the 2015 Ocean Trash Index. 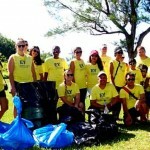 Last year, nearly 650,000 volunteers in 92 countries picked up over 12 million pounds of litter and marine debris. By conducting this once-a-year research, countries are able to identify the source locations and lobby for legislative changes to reduce ocean pollution. To see the full report from the 2013 cleanup, go here. Yet another international business taking things from Bermuda!If I want to throw my bike in the ocean and my trash in de bushes because I’m a raggamuffin it’s my business and no foreign investor should interfere. First they create jobs when I just wanna sit off and now they’re cleaning up the environment that I so wantonly destroy! When will this pillage of our Island stop?! Damn foreigners won’t even let us real Bermudians litter without interfering. Bermuda littering for Bermudians only!!! Pity the fools and TruthHertz!!! It sounds if you all need to grow up. You sound very childish and immature!! Have you reread the nonsence that you wrote. Why would you want to throw you bike in the ocean and trash in the bushes? 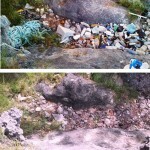 This is your Bermuda, Yes, I am a Bermudian and I helped to clean up everyones trash, it has NOTHING TO DO WITH INTERNATIONAL BUSINESS the foreigners assisted because some of you lazy dirty Bermudians like yourself only run your childish mouth and do nothing to assist is keeping Bermuda beautiful. 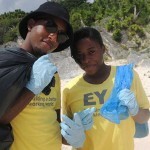 It is all about Keeping Bermuda Beautiful!! 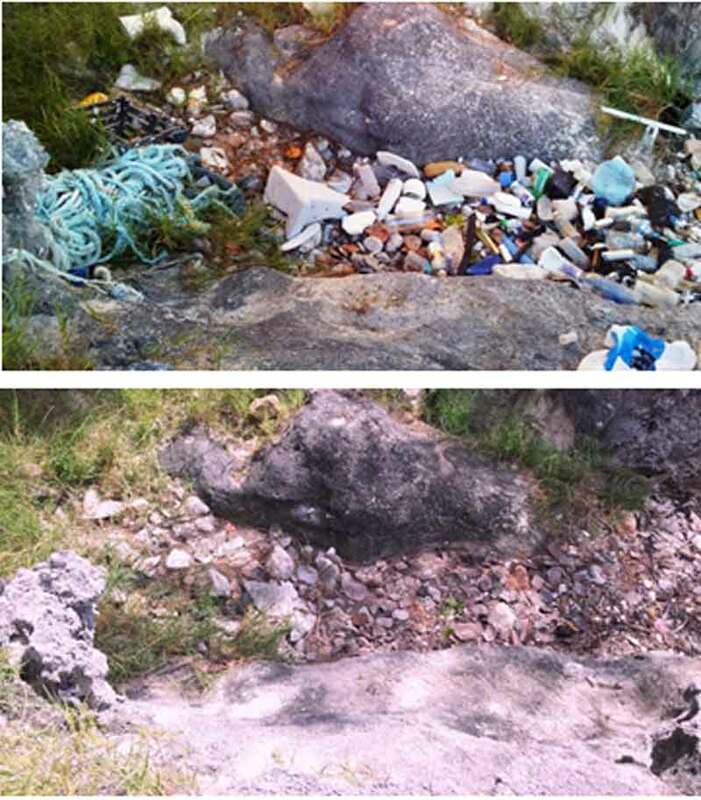 Bermuda littering for Bermudians only – this comment has a lot to be desired you should be ashammed of yourself to write something so ignorant. Bermuda will not survive without International Business, so get a life and stop making immature comments and do something positive for Bermuda instead of making negative comments. Im curious……when was the last time “the people” that complain and march every week…cleaned up the shoreline or any part of Bermuda??? Complain but have not contributed to society. CRAZY!! Thanks to all that cleaned up. Much Appreciated. They are too busy marching and throwing their trash along the sidewalk as they go. Thankfully we have International Businesses to clean up after them…and donate to our struggling charities…and give us jobs…and volunteer all over the island…Remind me again why they are the enemy and why we hate them so much? To all who participated, thankyou thankyou thankyou. DO NOT ***USE*** OUR CHILDREN !